Well, Sunday just gone was my first race for the year, Beerway at Daybreak. I was really looking forward to it and had been training really well in the lead up. I had been having some niggles in my left foot for about a month prior (stemming from Coast 2 Kosci) and about a week to 10days before race day, it was really giving me grief even when not running. Like all good ultra runners, I ignored it and got on with my race plans. We had a busy day the day before, checking things out and preparing for our pending move to the Sunny Coast. Super exciting. I then got to bed at a reasonable hour after deciding the girls wouldn't come down to Beerwah from Noosa, where we were staying, for this one due to me having to leave at 2:15am! 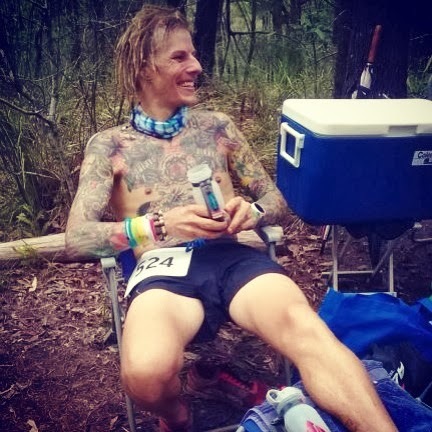 I have a goal this year of doing under 4hr 30min at a 50k event and was gonna shoot for it at Beerwah...that was until the weather arrived and I saw that the winner of the event in November (same course but at night) did just over 5hrs.....might not crack the goal in this event! So, Saturday morning, I got up, got sorted and down to the start line. It had been raining pretty decently since early evening the night before and there were still good solid downpours on the way to the race start...it was gonna be sloppy! Upon arrival, I met up with mum and dad and everything went as usual before the start at 4am. The start of the race went by pretty smoothly, apart from the fact that it was muddy, wet and pretty technical. The first 6.5k was pretty challenging and made more so by the use of headlamps. I made my way through this un-scaved to the first checkpoint and saw the beautiful Ann. She is a gem! After this there was some good running and all was clicking off well. At about 5:10am I turned off my headlamp and continued on my way. I could feel my foot was sore but kept on movin. The race operated by doing the 20k loop back to base, then the 30k loop back to base and finish. The rest of the first loop went by pretty much to plan and I arrived back to base in good spirits. I had been checking out footprints in the mud and guessed I must have been in about 5th position. When I got back to base, I headed off again and now had the fun of catching a some of the 30k runners who had started not long after my arrival at base after my first loop. This kept things interesting but my foot started to hurt. I ignored it and ran that first technical 6.5k pretty darn hard. I was bombing the hills and hiking with purpose...loved it! At about the 30k (about 3hrs) mark, I passed the guy in 4th position and kept moving well although by this stage my foot was bad. I got to the 33k checkpoint and was unsure if I was going to keep on going. There was a nurse there (one of the fairies) who iced my foot, strapped it and gave me some panadol. I decided to keep on going, although by this stage the pain was almost unbearable, making me grunt every few steps and affecting my gait. This was bad as then I started to get some pretty substantial pain in the back of my knee and calf because of the over compensating. I was very steady and obviously got passed by a number of runners in the 30 and 50k events. I continued to move forward as best I could, unsure what the rest of the race was going to give me, and even wether I was going to finish. I ran into Alun, the race director who was out on the course and had a chat to him. He was supportive as always and offered some words of encouragement. I got to a checkpoint at about 40k and a ultra running hero who I know (in my eyes anyway...heck she has done Badwater!) Susanna was there. She could obviously see I was in a bad way and she contacted Alun to come and pick me up in his vehicle. I sat down for a second and heard that it was about a 4.5k loop out and back to their checkpoint. After having one of Susanna's home made vegan balls (OMGosh....INCREDIBLE!) I decided to do the loop and see how I went. No real change. Amazingly painful, grunting, hobbling and generally in a bad way. Surprisingly, I passed a few people from here on in. I tried to stay positive and enjoy the moment and this was punctuated by seeing two wild horses. Beautiful. I kept on thinking of Tim Olsen going into beast mode and him grunting when he means business. Well I meant business, the business of finishing this race, one way or another. I got back to Susanna's checkpoint, was grumpy (I HATE being grumpy on the trails cause this is where my peace is, but my foot was so bad it was affecting all parts of me). I grabbed another one of those amazing balls and kept going as best I could. The last 6-7km went by about the same....really painful, hobbling when I could, getting to the finish line the quickest way I could. I arrived in a finish time of 5hr 48min and in 9th position. I was done. Physically, I didn't even feel tired or that I had done much, but my left leg, particularly my foot was destroyed. Very disappointing. My biggest regret of the day however is not acknowledging the people cheering for me at the finish. I am really sorry to you all that I didn't look up, smile and hoot and holla like I usually do. The injury had got the better of me and I just didn't have it in me. I am sorry for not having the attitude I usually do and I hope you can understand. Post race equated to ice, ibuprofen, numerous messages to my good friend and physio Nix and rest. A couple of days post race, I have had an X-ray and it has come back clear. I am due to have a MRI also as it is believed I may have a stress fracture in the fifth metatarsal of my left foot. Time will tell. This week however I am resting, hoping my foot comes good quick smart to start training for Wild Horse at Easter time. I want to thank everyone for their support in this race. The checkpoint volunteers were amazing and so so important in getting me through. Alun, you put on a top event and I know everyone enjoyed it, keep up the super work!! A big thanks to my sponsor too at http://injinjiper.cart.net.au for looking after me. Although the race did not go as planned, I am proud that I worked my way through it. Medically I probably should have stopped, but I think the DNF would have hurt more than the pain in my foot during the race. I continue to fall in love with ultra trail running, the good, the bad and the beautiful. It is an amazing sport and I can not wait for the next event to roll around! Run free, plant strong! Always time for a smile after a few k's on the trail! Congrats Matty great effort you wouldn't know how to be grumpy mate, always love seeing you, Stewy and the rest of the Grills Family all positive. See you at Wild Horse on easter Sunday.